If I’d won a scholarship to Harvard Law School the day before I went off to the seminary, I sure might have been tempted. It’s a fabled place and its graduates have their pick of very well-paying jobs. Bryan Stevenson was a young black man from a poor family who got the chance to go to Harvard. But he didn’t line up an impressive job with a prestigious law firm: he went to work defending men facing execution in the American South. Making enormous personal sacrifices, he went straight from Harvard’s leafy campus to death row. The title of his book, Just Mercy, is a play on words. On death row, he finds little justice and no mercy. But most of all, he finds darkness—human tragedy on a grand scale. 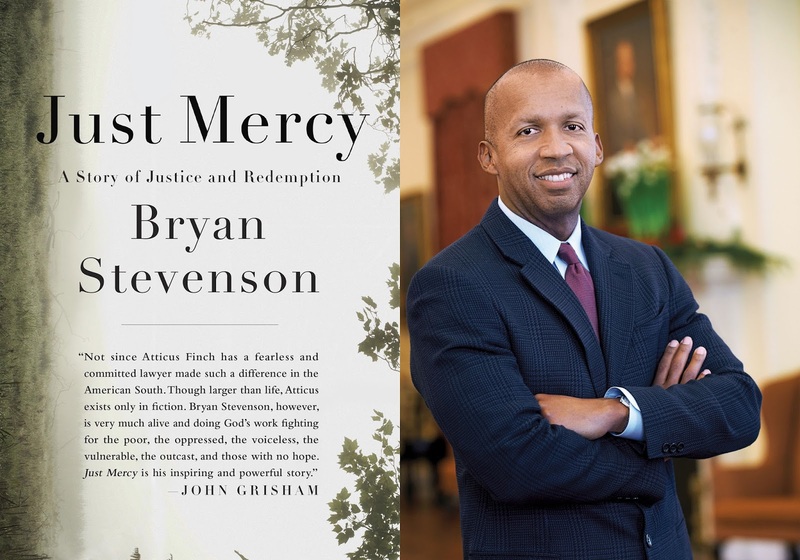 But into the darkness, Bryan Stevenson brings some light. Often he fails to get unjust verdicts overturned; sometimes he witnesses great brutality and anguish. Yet always he brings some light, some hope, to people walking in the shadow of death. The book is certainly a good argument against capital punishment—which is administered mostly to the poor, uneducated and vulnerable. Still, we have no capital punishment in Canada; haven’t had it for years. Why then did this book challenge me to imitate the author’s courageous stand against darkness? Why did people walking in the shadow of death call to me from its pages? I found an answer in the first reading at Mass today. Through the prophet Isaiah, the Lord calls everyone in every age to stand against injustice; every one of us is called to the same charity Bryan Stevenson showed to condemned men, although in the different circumstances of our own place and time. That sounds like a tall order, but it’s also an invitation. I’m not even finished Just Mercy, but already I envy the author’s radical commitment; I felt like getting on a plane and visiting prisoners on death row in some wretched prison. The first reading invites us to do what Bryan Stevenson did, but in a different way. There is injustice, poverty, oppression, hunger, homelessness and various forms of nakedness all around us. These tragic things aren’t the same in Canada as they are in the U.S., and they’re not the same in Vancouver as they are in other places in Canada, but they are here. They are here, and today the Lord calls us to stand against them. In last week’s Gospel we heard Jesus say “Blessed are those who hunger and thirst for righteousness.” This week, the Word of God helps us better understand what that means. Our reading from Isaiah says that the fight for righteousness is like dawn in the darkness—because it draws us into the light of the Lord. We ourselves are healed and helped when we work to heal and help others. Our own darkness is lit up by grace when we minister to those who walk through the darkest valley. The psalm takes this further. Things go well for those who are righteous. Their own hearts are secure, and they have nothing to fear from life. Righteousness brings a rich reward. Doesn’t it sound attractive? I envy Bryan Stevenson, despite the sacrifices he made and the hardships he endured, because I believe those words in Isaiah and the psalm. The truly miserable people in his book aren’t even the prisoners, but the heartless judges and warders who shut off all human compassion as part of their job. But enough about the darkness of death row. Where, here and now, do we find those in need of our righteousness and mercy? God has one answer very close to home. In the first reading, we heard about the naked and the hungry, but we also heard about finger-pointing and the speaking of evil. Righteousness isn’t always dramatic; we don’t need to visit the destitute or prisoners when there are people around us needing mercy: people who have hurt us, people we want desperately to judge or to gossip about. Which is not to say that charity stays at home. There are many ways in which we’re also called to a kind of charity closer to Bryan Stevenson’s. Most obvious, in our parish, is ministry to prisoners—a form of Christian compassion that so many of you have embraced. The work on the Downtown East Side that’s done by members of our parish council of the St. Vincent de Paul society is equally an example of charity that comes straight from today’s first reading and from the Gospel beatitudes. What is our parish sponsorship of refugee families if not a response to the Lord's call to bring the homeless poor into our house? But there’s much more. The people who walk in darkness are all around us. We live in a time of moral fog. Half our neighbours—at least—no longer can judge right from wrong. They don’t know why they’re on earth, they don’t know where to get help when they’re afraid, and more and more of them are thinking that choosing death is the answer to problems and pain. Don’t those people live on a kind of death row, waiting for the day when their number is up? We are called to break this yoke of confusion that binds the post-Christian generation. We are called to help people out of the oppression of uncertainty, and to free them from the oppression of fear. And we can do this. We can do this by sharing with them the joy of our Christian life. In the next few months, we’re going to talk about how to share your faith story with others, in a simple and non-threatening way. We can do this by sharing the basic truths of the Gospel. At the beginning of March we will again offer the Alpha course—a proven way to offer Christian answers to life’s scariest questions. And we do this in our Catholic schools. They are not only places where we teach the catechism. They are places of formation that equip young people to see through the darkness that surrounds them—to light up their way through life not only by Christian doctrine but by sound intellectual reasoning. All of this follows from what the Lord teaches us today through his prophet Isaiah. More glorious still, it’s part of the wonderful vision Jesus teaches in this morning’s Gospel. “You are the light of the world,” he says. We are called to radiate the truth and joy of the Good News. “You are the salt of the earth.” We are called to preserve what Satan wants to spoil. At Mass today, we recognize the darkness that surrounds us—but we celebrate our call to bring light, and peace, and healing, straight to the heart of it.